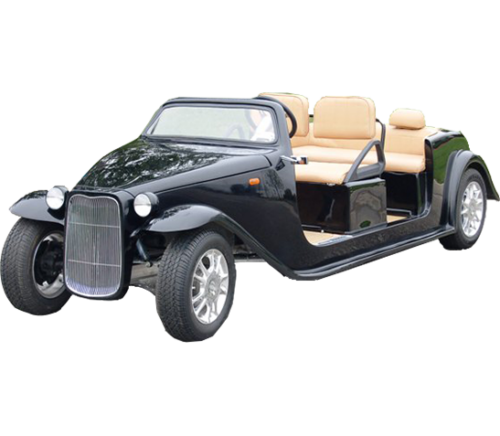 American Custom Golf Cars or ACG started as a small company in 1988. It was known as IFG, and it supplied body modification kits to the automotive specialty market. Ray Hoogengrad then purchased the company and spent the next five years establishing it into the world’s leading component and car manufacturing business. Not long after this, the company was designing and manufacturing specialty components and even producing movie cars. Some of their most memorable work can be seen in Batman 1 and 2, Sean Connery’s The Rock, and Dolph Lundgren’s Army of One. ACG, as it is known today, was established in 2000, when the company started a partnership negotiation with famous automobile hot rod designer, Boyd Coddington. This collaboration resulted in the market release of the California Roadster – a hot-rod styled golf cart. At the same time, ACG also produced on stage electric show cars for rock artists, and custom one-off show cars such as the world’s only Harley Davidson motorcycle limousine, and a Red Bull jet engine fuelled funny car. Today, ACG has an annual sales volume of 2,500 vehicles per year and 81 licensed distributors around the world – including Golf Cars Unlimited. 1. ACG casino golf cars have a powerful motor and battery system. Casino golf cars should have a powerful engine and batteries so it can be driven about and ferry guests around the casino complex. ACG’s California Roadster, Roadster-Limo, and 39 Roadster all have a high output 17.5 peak horsepower motor under its hood, making the cars powerful and efficient enough to be driven at speeds of up to 25 miles per hour or even a higher range from the industry average. All three cars also have a long-lasting 48-volt system industry leading Traction batteries managed by the SEVCON computerized controller, ensuring a maximum range of driving distance. 2. ACG casino golf carts are stylish and offer numerous features and functions. Looking at the California Roadster, Roadster-Limo, and 39 Roadster, stylish is an understatement with all three vehicles’ vintage look and feel. Aside from looks, all three casino golf carts offer a lot of features for its driver and passengers, including an onboard 12-volt converter that provides you an in-dash power source for your mobile phone, laptop, or any gadget your guests might need and have. All three cars also feature an automotive style master on/off key, self-diagnostic on screen capability, two locking glove boxes, two cup holders, and bag-well liner or bag holder. At the same time,all three cars offer customized paint and graphic schemes, which is perfect in promoting your casino. Other customizable features include leather interior upgrades, hidden AM/FM CD players, hardtop for sun protection, and even full multimedia systems that include DVD players and flip-down monitors. 3. ACG casino golf cars are guaranteed safe to use for your guests. 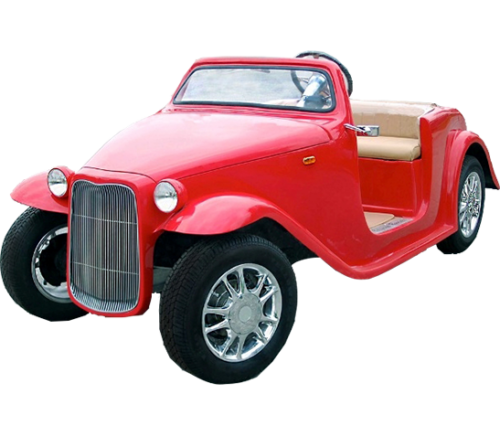 All three ACG golf cars include additional safety features such as standard headlights, brake lights, high mounted third brake light, turn signals, horn, and a standard 4-wheel braking system that includes front wheel hydraulic disk brakes. 4. ACG golf carts can be legally driven on roads. ACG has certified the California Roadster, Roadster-Limo, and 39 Roadster with the Federal Government (NHTSA/DOT), making all three a “neighborhood electric vehicle” or NEV. Hence, all three vehicles are qualified for street use and may also qualify you for a Federal Income Tax Credit with IRS. 5. ACG golf cars are considered top quality. All ACG low-speed vehicles including the three casino golf cars are engineered from the ground up, with the best and completely new parts. The units are built from rugged and corrosion-proof steel or aluminum beams. 6. ACG offers prime after-sales service. An exclusive 48-month unlimited mileage Powertrain Warranty covers all 2014 models ACG golf cars – this includes the California Roadster, Roadster-Limo, and 39 Roadster. So you are guaranteed to receive a great after-sales service no matter the mileage on your vehicles. be more than happy to assist you.